Louisville's newest premier Events facility, providing rental space for any occasion. Rental includes tables, chairs, linens, china, handicap accessibility, free parking, many amenities as listed in website. Also serving public Sunday Brunch Buffet each week, and offering special event dining on holidays, etc. Website lists all details, photos, menus, and reservation information. 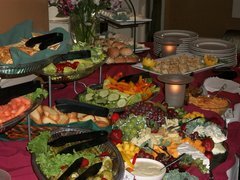 Personally-Designed Catering offered by one of Louisville's favourites, Gumby's Custom Catering.